CELLARIUS -Typus aspectuum, oppositionum et conjunctionum..
CELLARIUS,A. - Typus aspectuum, oppositionum et conjunctionum..
Typus aspectuum, oppositionum et conjunctionum.. - CELLARIUS,A. Size : 16.9 x 20.1 inches. / 43.0 x 51.0 cm. 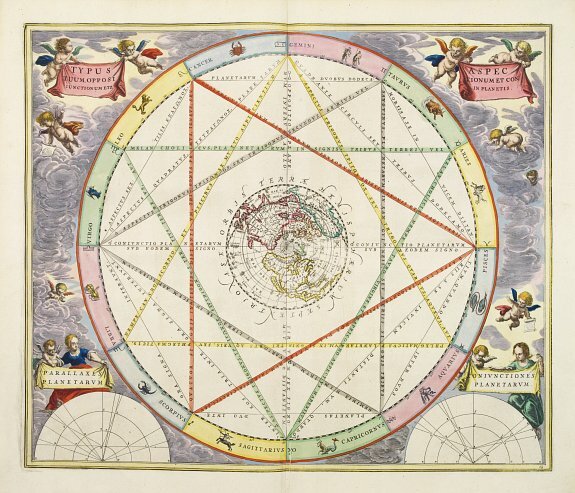 Description :A celestial chart with a circular projection map of the earth, centred in the North Pole, concentrating upon the opposition and conjunction of the planets. With two diagrams in the lower corners and two title-cartouches in the upper corners, surrounded by clouds and cherubs. An outer band depicts the 12 Signs of the Zodiac, including California as an Island. In Cellarius' Atlas Coelestis Schiller's system has been elaborated further. In fact, Schiller became more widely known by Cellarius' atlas than by his own work.